The Dance Conservatory has been designed for beginning through advanced dancers to identify, nurture, develop, and train the Baltimore community’s children in the art of dance. The program offers students the opportunity to foster and enrich their dance education through the development of technical proficiency, artistic growth, and creativity. Multiple disciplines are offered: Ballet, Jazz, Tap, and Contemporary. Specialty classes, including Musical Theatre Dance, Acrobatics, and Hip Hop, allow dancers to further their skills for specific venues. Classes such as Yoga, Pilates, and Stretch/Conditioning are designed to help cross train dancers and athletes. Classes are held weekly, Monday through Friday afternoons, evenings, and Saturdays. 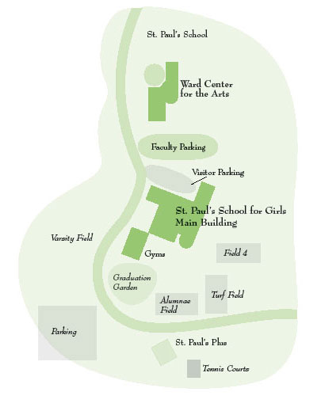 St. Paul's School for Girls is approximately one mile north of the intersection of Interstate highways I-695 and I-83 on Falls Rd. Take exit 23B, Falls Road. Follow Falls Road north one mile to the third traffic light at Falls Road and Seminary Avenue. Turn left at the entrance to The St. Paul's Schools. Drive past the playing fields, up the hill, and turn right at the St. Paul's School for Girls sign at the main building. From downtown Baltimore, take I-83 north (Jones Falls Expressway). As the expressway ends, stay in the left lane and go past the I-695 exits. The expressway becomes Falls Road. Follow Falls Road north through the third traffic light at Seminary Avenue. Turn left at the entrance to The St. Paul's Schools. Drive past the playing fields, up the hill, and turn right at the St. Paul's School for Girls sign at the main building. Drive south on Falls Road. Pass the entrance to St. Paul's School. Continue down the hill to the traffic light at Falls Road and Seminary Avenue. Turn right at the entrance to The St. Paul's Schools. Drive past the playing fields, up the hill, and turn right at the St. Paul's School for Girls sign at the main building. TDC Classes are held in the main building at St. Paul’s School for Girls. Upon entering the building you will be greeted at the front desk and directed to either Studio 322 (straight past the administrative hallway) or Studio 115 (in the middle school hallway). TDC is proud to include the AMERICAN BALLET THEATRE® National Training Curriculum, a breakthrough 9 level program that combines high quality artistic training with the basics of dancer health and child development. The ABT® National Training Curriculum consists of a comprehensive set of age-appropriate, outcome-based guidelines to provide the highest quality ballet training to dance students of all ages and skill levels. Primary through Level 3 will be taught by ABT® certified Teacher, Natasha Cooper, who has successfully completed the ABT® Teacher Training Intensive in Primary through Level 3 of the ABT® National Training Curriculum.